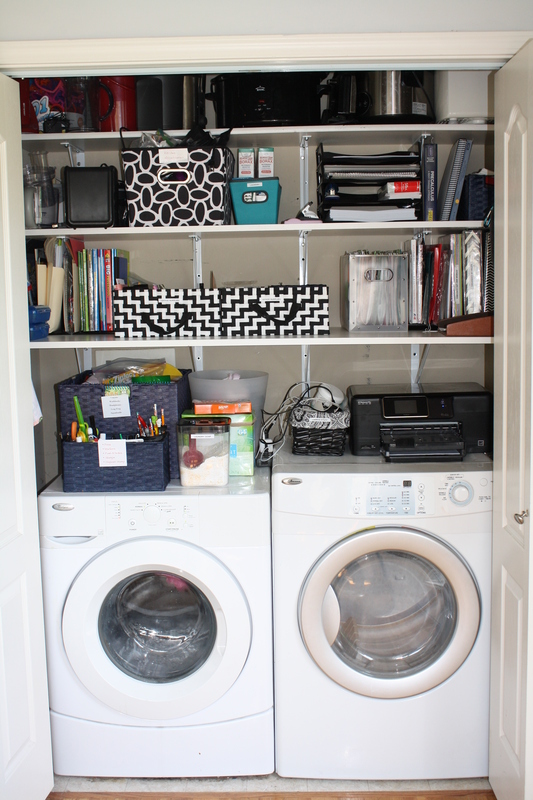 Welcome back to my series “Inside a Professional Organizer’s Home”! Today’s post leads us into my kitchen. I shared in my last post how I store many kitchen items/tools in my laundry closet that is inside my kitchen. Below is my very small kitchen. I used to have an awkward island we had purchased from Ikea, but I finally got sick of our kitchen being so tight and sold it. That’s when we built the extra shelves in the laundry closet. Storage problem solved! I also followed my own advice and purged items I rarely or never used. My basic instructions for organizing a kitchen on your own is to start small and begin by purging items you rarely or never use. If you take on the whole kitchen you may get overwhelmed and then quit. We don’t want that! Next, choose a small area and start by removing everything. While you do this, group items by like kind and function. Once it’s clear, you will have a better idea as to what you have and how much space it really needs (or that you don’t need 12 cookie sheets!). You can then return items in such a way that improves visibility and function. Another kitchen trick is to keep items you use often within quick reach and sight. Your turkey platter does not need to dominate prime real estate in your kitchen (unless you use it every week, but who does?!?!) Lastly, I prefer to keep counters as clear as possible. Not only does it allow ample room for prep work, but it reduces visual clutter. A Princeton University study showed that visual clutter slows our productivity and reduces focus. Who has time to spare for that!?! 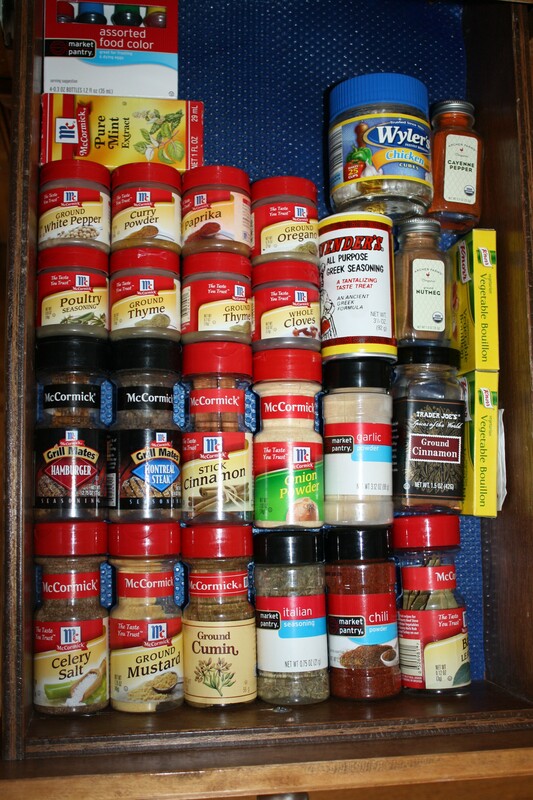 First, I like to use a drawer to store my spices. Since I am not a chef, I don’t have an excessive amount of spices. This may not be great for those cooks who have quite a few. The drawer is perfect for me because it allows for quick and visible access to them. Most people have spices that are expired or not used and can easily purge some of them. Also, the drawer’s location is important. It should be close to where you prep or cook your food. Second, I like to keep my sandwich/freezer bags, etc. in a drawer for quick access. 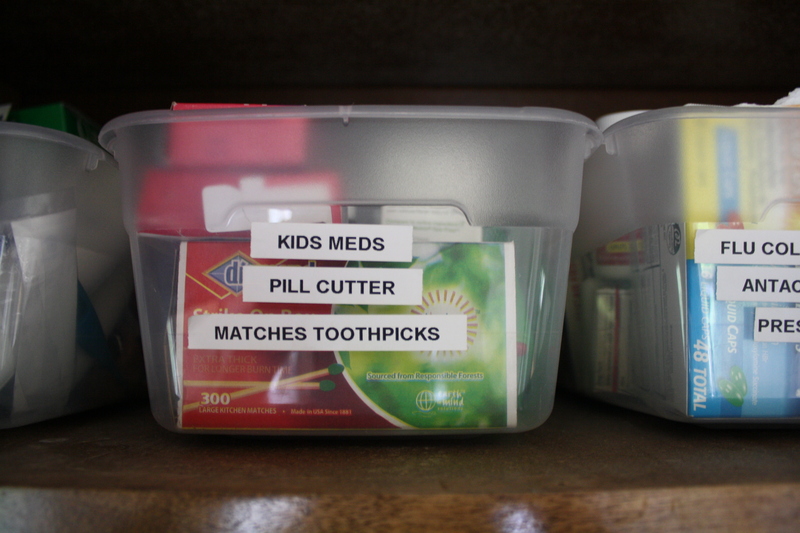 Third, I keep our medicine stored up high above our stove/microwave in small labeled totes. As I mentioned in a previous post, labeling helps everyone know where to find things and where to return them. My husband or sitter can find what they need, when they need it (and hopefully return it to it’s home!). Fourth, I keep our cleaning items stored in a cabinet next to the sink. This keeps them out of reach from little hands and helps us have them within quick reach. This is an example of when it is helpful to remove and/or adjust the shelves in your kitchen (if it’s possible). When I organize a client’s kitchen, I almost always move shelves around to increase the function and use of cabinet space. I personally have about four shelves stored in my garage because I chose to simply remove them. Also, I keep other random items we use often in this cabinet and labeled them. Lastly, I recently chose to reduce our paper towel use to save money and be a bit more “green”. I saw this on another blog I follow and just love it! I bought 36 cheap white wash cloths, a white and a black trash can. I labeled them and chose white for clean and black for dirty. They are stored under my kitchen sink. I wash them once or twice a week on the sanitize cycle and DO NOT fold them. Why waste the time? I just love using them! Cloth cleans so much better than paper! What kitchen organizing tricks do you love the most? Please share! I love the wash cloths and the trash can idea and the small open totes for the medicines. I am going to use these ideas. Thanks for sharing.